John Clark, Fisheries Administrator of Fish & Wildlife, gave an over view on the various fisheries in DE. Stripped Bass spawning stock has not recovered as anticipated over the past 5 years. Coastwide, Over 4 million stripers were harvested in 2017. An assessment is forthcoming and an action plan will follow, possibly involving a change to minimum length and creel limits in the year 2020. Summer Flounder mortality is below the threshold, thus the stock is in decent shape. Tautog and Black Sea Bass stock is in decent shape. Weakfish spawning stock and recruitment (age 1 year fish) levels are still very low, under 5 million coastwide. Cobia will be regulated in DE waters. Possibly 1 per trip, minimum length 32 inches. 2019 Minimum fish length and creel limits on most species likely will be the same as in 2018. Note that this is NOT etched in stone. Fish & Wildlife Director Dave Saveikis announced the 2019 Delaware Fishing Guide is out and available at your favorite tackle shop. Changes were made to the Sport Fishing Tournament program. A Youth Division with adjusted size requirements is new his year. Check pages 25 & 26 of the guide for more info. A Recreational Fishing vehicle registration plate is coming this summer. It will feature either a Smallmouth Bass or a Striped Bass, depending on the purchaser’s choice. Cost will be $90, of which $80 will go to Fish & Wildlife and be eligible for matching federal funds. Parks & Rec Director Ray Bivens gave a review of the recent fee increase and 17,000 cap on surf fishing vehicle permits. There was a surge in permit sales in January, with some 3300 permits being sold prior to the fee increase taking effect February 1, 2019. Permits are first come, first served. 51% of all permits are on vehicles registered in Sussex County. Free volunteer firefighter tags are included in the 17k cap. Bivens noted the challenges this presents to Parks & Rec. Other information presented can be found in the report of the January 17 Parks & Rec Advisory Council meeting that has been posted on the website (see below). Bivens noted the DMS support for more enforcement officers and enforcement efforts that was presented at the recent Joint Finance Committee hearing on the 2020 DNREC budget. The new full-time Ranger, Tyler Beutler, will start field training by March 1. He will be based out of DSSP. Chief Kline reported on enforcement. Workweek for all 7 rangers will increase to 40 hours/week. 174 persons were cited for surf-fishing violations in 2018. 43% were cited for not having a surf-fishing vehicle permit. 2% were cited for not having fishing tackle and 2% were cited for using a borrowed surf-fishing permit. The remainder were cited for a variety of offenses. Parks & Rec is in favor of seasonal officers (the Green Shirts) having enforcement powers for minor violations, such as actively engaged and no permit. Legislative action must be taken to give the seasonal officers those arrest powers. 4X4/AWD and minimum clearance requirements discussed. 4X4 not required. How and where to measure minimum vehicle height? Joint parks & Rec/DMS initiatives were presented. P&R looking to educate the public on beach use, centering on the need to air down. Large signs – red and black - have been placed at vehicle crossing advising public they are leaving roadway and a permit and equipment is required. DMS involvement in vehicle crossing checks was discussed. A video on the history of surf fishing and a video on beach driving are being planned. DMS to have input in the history of surf fishing video, and possible financial support for the beach driving video. At its January 18 meeting, the Advisory Council for the Division of Parks and Recreation voted to implement an increase in fees for the Surf-Fishing permit and to limit the number of permits to be issued at 17,000 annually. The permit will increase $10 per year for residents while non-resident fee will increase $20 per year. The 17,000 cap on permits issued is slightly less than the 17,361 permits issued in 2018. Over 100 atended this meeting More than 20 people offered testimony to the Advisor Council at the January meeting. A recurrent theme of the comments made was: increase enforcement of current regulations, particularly regarding being “actively engaged.” Most comments were against the setting of a limit on the number of permits issued. A representative of the DE Beach Access Coalition stated the Coalition were in favor of reducing the number of vehicles on the beach and further restricting access to multi-use beach areas bordered by property owned by members of the Coalition. -51% of those that made written comment to the Council supported increased enforcement. According to Parks & Recreation, the 17,000 permits will be issued on a first-come first served basis. No permits will set aside for holders of the numbered surf tags that were sold at auction. No group or type of permit holder, be it resident or non-resident, will be allocated any number of permits. Who bought the 17,371 permits in 2018? The Delaware Mobile Surf-fishermen, Inc. has recently learned that the National Marine Fisheries Service (NMFS), a branch of the National Oceanic and Atmospheric Administration (NOAA) would be issuing Incidental Harassment Authorizations (IHAs) to start seismic testing via an “air gun” in the Mid- and Southern Atlantic coast of the U.S. This testing is a prequel to opening the Atlantic Coast to off-shore exploration, drilling and production of oil and gas. This area includes coastal Delaware. On December 7, DMS contacted the Assateague Coastal Trust (ACT) for more information on this matter. The ACT, headquartered in Berlin, MD, was a tremendous source of information in 2016, informing varied DelMarVa groups on the procedures to be used and the harm it would cause. “The National Marine Fisheries Service issued incidental harassment authorizations (IHAs) to survey companies which gives them permission to harm marine mammals while they search for oil and gas deposits offshore. The next step in the process is for BOEM to issues final permits to the seismic companies. This is expected within the next month. (Emphasis ours). Click here for the link referenced by Mr. Weiland. There is also a map defining the area for which permits are to be issued. In short, it runs from the Delaware Bay to Florida. DMS members can get future communications from the ACT via their website or via email. lack of scientific evidence that refutes the possibility of hearing loss to marine mammals. DMS will make every effort to keep you, our members, informed on this matter. Delaare Mobile Surf-Fishermen, Inc., was recognized by the Delaware Department of Natural Resources and Environmental Control (DNREC) as the 2018 DNREC Volunteer Conservation Group of the Year for "advancing the DNREC mission through outstanding service." Governor John Carney made the presentation on Governor's Day. July 26, 2018, at the Delaware State Fair in Harrington. Joining Governor Carney in the presentation ceremony were State Senator Ernie Lopez, DNREC Secretary Shawn Garvin and DNREC Director of Parks and Recreation Ray Bivens. The program notes included this information: "The Delaware Mobile Surf-Fishermen have supported DNREC on beach driving classes, beach grass planting and special events such as the Chidlren's Fishing Derby on the Cape Henlopen Pier and the Special Olympics DE Family Day At The Beach event. They worked with Delaware state parks on the overcrowding of vehicles on mult-iuse beaches and encouraged legislators to support additional Park Ranger positions for the DE beaches State Parks." Accepting the award on behalf of you, the Members of the DMS, was President Bruce West and Director Harry Aiken. Other DMS Officers and Directors were in attendance. The annual meeting with state legislators and DNREC officials was held February 20, 2018. DMS extends a big thank you to the legislators and DNREC officials that took part. Much discussion on enforcing current regulations, notable actively engaged and glasscontainers on the beach. It was stressed that if violations are observed, they be reported to Parks& Recreation Enforcement immediately. Discussion was held on getting seasonal personnel the authority to issue citations for violations that occur in their presence. Any such authorization for seasonal personnel would require training and change is legislation. DMS supports the hiring of additional sworn enforcement officers. The number of vehicles accessing the beach via surf fishing permits has increased almost 300% since 2006, while the number of enforcement personnel remains the same. DNREC is hopeful they will get funding in 2018-2019 fiscal year budget for 1 additional full-time enforcement position. If approved, that person not be on the job this summer. Impact of the Big Chill on enforcement efforts. Sworn personnel handling parking duties there reduces their presence on the beach to enforce the existing regulations. P&R enforcement turned away 10% of vehicles for not having fishing equipment while making vehicle checks in the parking lots. •No surf fishing vehicle permit/driving off roadway –51 cited in s017, 46 cited on 2016. Drivers that get stuck where it was determined that the driver was lost and did not intend to drive on the beach were cited for driving off the roadway. •Underaged consumption of alcoholic beverages – 20 cited in 2017: 18 cited in 2016. There was a 65 % conviction rate for those persons cited. Revocation of a surf-fishing vehicle permit for serious and repeat violations was discussed. A permit can only be revoked by the Director of Parks & Recreation. Air Station improvements underway at Beach Plum and Gordon’s Pond access points are funded in part by donation from The Friends Of Cape Henlopen. The structure to house the air pump is complete at Beach Plum, but not operational. The structure to house the air pump is under construction at Gordon’s Pond. There will be additional area for vehicles to get off the access path while airing up at Gordons Pond. Both stations will be capable of handling 2 vehicles at a time. Request that P&R remove materials that obstruct vision of drivers of vehicles that are leaving the beach at access points. Most notable in Bethany-Fenwick. Faithful Steward beach access path has been greatly improved. The end of the CHSP Fishing pier is closed due to ice damage. It was noted that the recent repairs were a "band-aid." In-house conversation going on, exporing options for replacing the CHSP pier. Costs would be in millions of dollars. Striped bass – a new stock assessment is underway. No change anticipated in 2018 striped bass regulations. Sea bass – now in regional management, DE to NC. Most likely the season will be May 15 to Dec 31 with no closures in that period. Minimum length 12.5”, 15 fish/person. Tautog- again, DE-MD-VA regional management. Closed tog season will be May 16 – June 30. Minimum length raised to 16”, 4 fish/person. A former CML ferry boat is being prepared for becoming part of the artificial reef sites, may be ready to be sunk in June. DE River rock removed during dredging operations will be used for artificial reef material. DNREC will have some say in off-shore windmills for electric generation. They would be many miles off-shore – perhaps near the 12-mile limit. Gov. Carney is opposed to seismic testing and off-shore drilling for energy exploration. Has sent letter to US Gov’t on this. By email, Sen Carper office said there are no plans for making CHSP part of NPS. The annual closure of The Point at Cape Henlopen State Park will occur on March 1, 2018. The closure applies to vehicles and pedestrains alike. The closure is mandated via a 1990 Memorandum Of Agreement between the US Fish and Wildlife Serive and DNREC as part of the piping plover management plan. The Point normally re-opens on September 1. On February 14, DMS President Bruce West and Secretary George Mood appeared before the legislature’s Joint Finance Committee (JFC). The JFC was in session to consider DNREC’s budgetary request in the next fiscal year. They voiced the support of the DMS for additional monies to be allocated for the hiring, training and equipping of 3 sworn Division Parks & Recreation Enforcement personnel. During their appearance, they noted that the number of Parks rangers has remained the same since 2006, while the number of vehicles accessing the beach by way of the surf fishing permit has grown 3-fold to 17,000. These thoughts were again expressed to the local legislators during the February 20 meeting between DMS and state officials. The annual meeting with state legislators and DNREC officials was held February 21, 2017. DMS extends a big thank you to the legislators and DNREC officials that took part in an open, honest and informative meeting. The major topic was the efforts of the Delaware Beach Access Coalition (DBAC) to restrict access to portions of beaches currently accessible by surf fishing tag equipped vehicles. The DBAC is a group of owners of private communities along both sides of Coastal Highway (DE Rt. 1) that front the State park beaches, notably in the Fenwick Island area and 3Rs Road access area of Delaware Seashore State park. Those communities have enjoyed direct access to the State Park beaches via a Dune Crossover Agreement (DCA) between them and DNREC’s Division of parks and Recreation. They paid a modest fee to Parks and Rec for a permit that allows the owners and their guests to walk over / through the dunes to the beach that front their communities. Communities on the Inland Bays side of DE Rte. 1 have entered in agreements with those communities that front the State Park beaches on the Oceanside of DE Rte.1 to use their Dune Crossovers. While these communities claim the dune crossovers are open to the public, the communities they serve are either gated communities or posted as private and no trespassing. The DBAC claim that the dune crossovers are open to the public is based strictly on the agreements with the communities on the Inland Bay side of Rte. 1. In effect, they are not open to anyone but an owner or a renter from one of the communities. The southernmost 200 yards of Delaware Seashore State Park (3Rs Road Access area). Currently, 4,080 yards of beach in the first 2 areas are designated 24 hours multi-use /beach vehicle access, with 918 yards closed to beach vehicles at the Fenwick Island Swimming area. If DBAC’s demands be met, the 24 hour multi-use/beach vehicle access are would be reduced to 3, 024 yards, or a loss of 1056 yards, or 6/10 of a mile. This includes 3 sections of beach that would be closed due to inaccessibility. The DBAC demands would further prohibit surf fishing vehicles from accessing via the beach currently surf fishing vehicle accessible areas that are not covered by the dune crossover agreements. Most notable is that driving on the beach from Middle Beach Crossing to either York Beach Crossing (to the north) or to the South Beach Crossing (adjacent to the Fenwick swimming beach) would be prohibited. Additionally, changing the multi-use /beach vehicle use designation would prohibit to surf fishing vehicles access to the southernmost area of 3Rs Road Crossing. Curiously, the DBAC further maintains the position that communities that are south of the end of the current surf fishing area at 3Rs Road Crossing - areas that are not in the State Park - would enjoy the benefits of their proposal. Discussion on this topic, including its immediate impact and future implications on restricting and prohibiting beach access to all residents and visitors to Delaware’s State Park beaches, was lengthy and thorough. DMS and the legislators present stood in support of DNREC opposition to the demands of the DBAC. N.B. : Some days later, DNREC announced it would not restrict the areas covered by the dune access agreements to surf fishing vehicles. The proceeds from the auction of numbered surf fishing vehicle tags will remain in the Division of Parks and Recreation. Once the current supply of blue and white non-numbered plates are exhausted, they will be replaced with a yellow on blue non-numbered plate. Tags will remain valid for the calendar year. This was in response to recommendation that tags be valid for a year from the month of purchase. The anticipated number of surf fishing vehicle tags to be issued in 2017 is not expected to change much from the number issued in 2016. Parks & Rec have turned away approximately 10% of vehicles during beach checks. The most common reason was not having a surf fishing vehicle permit. Improvements were made to the air station at York Beach Crossing. Three air lines, an upgraded compressor and a widening of the area around that station are complete. Improvements for the air station at Beach Plum Island (Broadkill) are moving forwards, with anticipated completion by May 2017. Plans for improvements of the Gordons Pond Crossing air station include widening the area, and increasing with number of air lines with an upgraded compressor require interaction with DNREC’s Division of Watershed Stewardship. Navy Crossing will be split to improve turns for going north of south when accessing the beach. Tree trimming being done near Herring Point. Trimming of vegetation to improve sight lines when entering DE Route 1 from the various crossings were discussed. Discussion on expanding the number of full-time Parks & Rec enforcement personnel centered on monetary issues facing the state of Delaware. 5662 surf fishing vehicle tags were issued in 2006, while 16400 were issued in 2015. While the number of surf fishing tags issued increased by 289% over that time period, the number of enforcement personnel remains the same: 6. The legislators were most informative in this matter. Poor weakfish stock numbers are attributed to predator action, not by overfishing. Spiny Dogfish are seen as the #1 predator of Weakfish. Tautog and black sea bass regulations may change for 2018 and beyond as differences between DE, MD and VA regulations are worked out. Changes may be made to minimum size, creel limit and closed seasons, but it is too early in the process to say what will happen. DNREC's Division of Fish and Wildlife will hold a Public Hearing on proposed changes to Striped Bass regulations. Hearing will be Monday, October 24, 2016 at 6:00 PM at theDNREC Auditorium, 89 Kings Highway, Dover, DE. Proposed change would clarify language that the recreational anlger IS NOT required to tag a Striped Bass. There are several changes that apply to the commercial fishery. The Department removed an unnecessary harvest constraint (slot size limit) on the commercial fishery that resulted in the needless waste of Striped Bass through an Emergency Order. This action proposes to adopt those measures through the normal regulatory process and to modify Striped Bass tagging requirements for consistency with 7 Del. C. §943. Other proposed measures include lost tag reporting; application of weigh station tags within 12 hours of landing; and actions to ensure compliance with commercial reporting and tagging requirements. Read the entire Public Notice by clicking here. Final Meet & Greet for 2016 was just phenomenal. Huge Thank You to Tommy Farmer! Close to 100 DMS members attended plus a few surprise guests. Casting pro Tommy Farmer and Harry Aiken were on hand to offer help in fine-tuning casting techniques. Both Tommy and Harry spent several minutes with those looking for tips to get a few more yards on the cast. Outdoors Delmarva will be airing a show on Tommy Farmer & Harry Aiken. Look for it around the end of September or the beginning of October. With that being said, thank you to all that attended. Find more photos of the event on our Faccebook page. Now it's time to get ready for tournaments! March 19th was a cold, overcast day with NE winds of 20 MPH cming off the ocecan. That did not deter an army of volunteers that turned out to assist in DNREC's annual beach grass planting event. Volunteers planted the beach grass in areas stretching from CHSP to Fenwick Island. DMS was on hand to provide transport for the volunteers to planting areas in DSSP north on the Indian Rivier Inlet. The DMS Cook Shack was also on-hand to provide snacks and beverages to the volunteers after they spent hours on the beach Hot chocolate was a popular item to wash down a hotdog. You can find photos on the DMS Facebook page. Some 12 pull-through sites will be added. cabins to be finished this year. The project is slated to be completed in 2017 and is 50% funded by money from the federal government. The balance is from Park and Recreation. Click here for more info from Parks & Rec. Comments will be accepted for a period of 90 days, ending on May 1, 2016. Click here for the full NPS press release. Click here to access the AINS draft GMP. Click here to read DMS President Bruce West's letter on seismic air-gun testing. DMS was part of a forum on the Assateague Island National Seashore (AINS) draft General Managment Plan (GMP). Hosted by the Assateague Mobile Sportsmen's Association (AMSA) on Saturday, Feb. 27, the attendees were given an overview of the GMP and input sought from those attending. The Forum was moderated by AMSA President Bill Justice. Mr. Bill Reddish, Community Liason for Congressman Andy Harris of Maryland's 1st District (which includese AINS) stressed the need for all persons that utilize AINS to comment on the draft GMP. DMS President Bruce West acknowledged that Mr. Justice should take the lead in determining which of the 4 Alternatives (see below) should be preferred. The forum did not form a concensus on which is the preferred Alternative. That will be determined in the coming weeks. Comments on the GMP will be accepted for a period of 90 days, ending on May 1, 2016. Three (3) Public Comment meetings will be held later in March: one in Eastern Shore of Virginia, one in the Berlin, MD area and the third near Cambrdige, MD. Dates, times and full locations will be posted here as soon as the information is made available. It is not only ORV use that is governed by the plan; the Alternative that will be chosen will guide the NPS for all activity at AINS. Given that the last GMP was implemented in 1982, the future of the park for the next 20-30 years is in the balance. The NPS would continue to manage seashore resources and visitor uses as it does today, generally reflecting the broad management goals developed by the seashore's 1982 GMP. Decision-making would be based on existing conditions and available information, but lacks a comprehensive planning framework that addresses the full range of contemporary and potential future issues. would be the primary forces influencing the condition and evolution of natural resources. primary forces influencing the condition and evolution of natural resources. Alternative 3 represents a long-term shift of park facilities and assets to adapt to climate change. effects of climate change as the seashore shifts from a more traditional developed park to a more primitive park. The entire draft GMP is some 3 inches thick, double sided printing. Buried in that document is the future of ORV use at AINS. It will take some time to flesh it out. Click here to access the AINS fraft GMP. 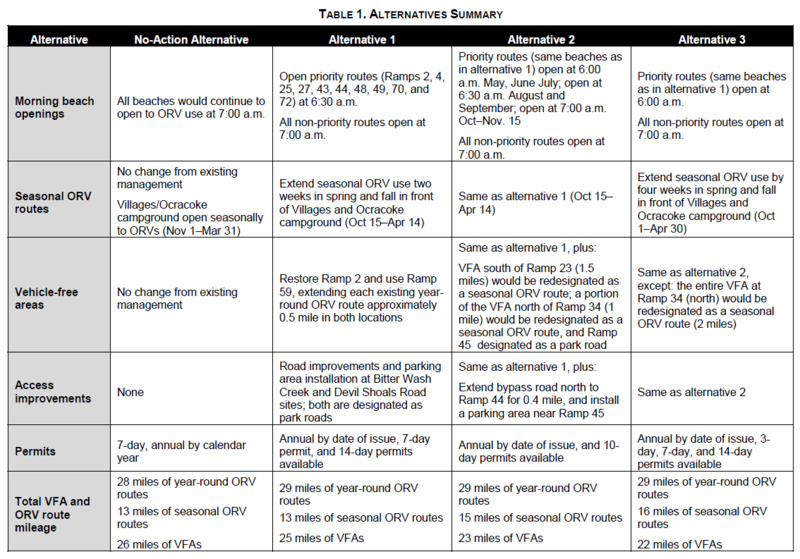 Extending the length of fall and spring seasonal ORV routes. Modifying the size and location of vehicle free areas. Wait... what? EA?? Alternatives?? What does that mean? It means that the NPS has released an Environmental Assessment on the 4 Alternatives for modifications to the ORV rule at CHNRSA. Rather than paraphrase, here is an email received from John Couch, President of the Outer Banks Preservation Association (OBPA). It explains things perfectly. By the way - Don't pass on this and complain later on that you don't like what the NPS is doing at Cape Hatteras National Recreational Seashore or that OBPA or CHAPA is not doing anything to get more ORV access. Please Submit Your Comments Now! On February 17, the National Park Service released for public review the Environmental Assessment (EA) for consideration of modifications to the ORV rule currently in effect at the Cape Hatteras National Seashore Recreational Area. As described in the press release below, public comments can be submitted during the 30 day period ending on March 18, 2016. The just released EA is the next step in the process that could ultimately lead to modifications to the ORV rule to improve access to the Seashore. CHAPA will compare the EA to the 2015 proposals and submit comments accordingly during the next 30 days. Your individual participation in the EA comment period is also critical to the success of our efforts to improve access at the Seashore. CHAPA urges you the review the press release and the EA and provide comments. As you may recall, the promulgation of the ORV rule was a long, highly regulated process. The current rule was implemented in February, 2012. Rule changes can only be implemented after following the same process used to establish the original rule. Therefore, opportunitiies to make rule changes such as the ones under consideration now are few and far between. The EA is a 169 page document prepared in accordance with the National Environmental Policy Act (NEPA). Click here to open or download the entire EA in pdf format. While you may not be able to read the entire document, you will want to review the information concerning the four alternatives discussed by the NPS. Click here to view the short version, Table 1 - Alternative Summary. The NPS preferred alternative is Alternative 2. These alternatives are described in detail with accompanying maps in other sections of the EA. Again, your participation in the comment period is critical to achieve our common goal of improved access at the Cape Hatteras National Seashore Recreational Area. Cape Hatteras National Seashore (Seashore) released today, for public review, an environmental assessment (EA) for the consideration of modification to the final rule for off road vehicle (ORV) management. The Seashore is holding public comment meetings to consider changes to the ORV special regulation (final rule) as it relates to morning opening of beaches, extending the length of fall and spring seasonal ORV routes, and modifying the size and location of vehicle free areas. This EA, prepared in compliance with the National Environmental Policy Act, will be open for review and comment for 30 days from February 17 - March 18, 2016. This EA was prepared in response to the Defense Authorization Act of Fiscal Year 2015 (Public Law 113-291) pertaining to the Seashore's Off-Road Vehicle (ORV) Management Plan. The EA is available for review and comment at: http://parkplanning.nps.gov/caha-orv-ea. Select the "Open for Comment" link to view and comment on the EA. Comments can also be mailed to: Superintendent, Cape Hatteras National Seashore, 1401 National Park Drive, Manteo, NC 27954. To ensure your comments are included in this process, they must be entered into the above referenced website or postmarked by March 18, 2016. Comments will not be accepted by fax, email, social media, or in any other manner than those specified above. Bulk comments in hard copy or electronic formats submitted on behalf of others will not be accepted. The Atlantic States Marine Fisheries Commission will hold Delaware's Public Hearing on Draft Addendum XXVII to the Summer Flounder, Scup, and Black Sea Bass Interstate Fisheries Management Plan Tonight (1/12/16) in Lewes. Draft Addendum XXVII was initiated to consider extending the use of regional management approaches for the 2016 recreational summer flounder fishery, including an option that would allow for a Delaware Bay specific region for the New Jersey portion of Delaware Bay. The Draft Addendum also includes options for extending use of ad‐hoc regional management approaches for black sea bass recreational fisheries in 2016 and 2017. While this Addendum should keep Delaware's 2015 Summer Flounder and Black Sea Bass regulations in place for 2016, Delaware anglers may be interested to learn more about the management option which would allow New Jersey to have one size and possession limit in the New Jersey portion of Delaware Bay and a different size and possession limit for the rest of New Jersey. We urge you to attend and offer your own opinion on the Management Plan. An "Inside Road" has been completed between Ramp 44 in Buxton and Ramp 49 in Frisco. The Inside Road runs four miles behind the dunes and will allow off-road vehicles to travel between Ramps 44 in Buxton to Ramp 49 (Billy Mitchell Airport) at the NPS Campground in Frisco without having to return to Highway 12. The Park Service also added another ramp, Ramp 48, just one mile to the east of Ramp 49, to allow more access to the Frisco beach, especially when areas are closed for turtle nest hatching. Construction of a new Ramp 63 on the north end of Ocracoke Island has begun. Completion expected in Spring 2016. DMS took 2nd place at AMSA's 11th Annual Ronald Bounds Memorial Surf Fishing Tournament held at Assateague Island National Seashore on October 17th! Click here for the photo of the team! The National Parks Service (NPS) is accepting written comments on changes to the ORV rules at Cape Hatteras National Seahore. The NPS options as well as the Cape Hatteras Access Preservation Alliance (CHAPA) comments can be found here. Opeingn priority beaches as soon after first light as possible. Seasonal beaches in front of villages should be open earler in Fall and later in Spring. Seasonal beaches not in front of villages should be re-opned to ORV access no later than September 15. NPS should re-classify currently designated vehicle-free areas (VFA) - that currently encompass 25.25 MILES of beaches - to seasonal or year-round ORV routes. NPS should re-classify some seasonal ORV routes to year-round ORV routes. NPS should issue 10-day permits in addition to the annual permits. NPS should issue annual permits valid for one (1) year from DATE OF ISSUE. Your written comments on changes to the ORV rule can be made on-line here. Every person that uses the Cape Hatteras Natonal Seashore should take the time to read the information in the link to the OBPA website. Send your written commentx to the NPS by August 21, 2015 or attend one of the 5 public scoping hearings the NPS has scheduled. See the meeting schedule at the end of the post below this one. The rule currently designates ORV routes to be closed from 9:00 pm until 7:00 am. The new law requires that the utilitization of a rolling schedule be considered to allow access earlier than 7:00 am. The expectation is that NPS would schedule turtle patrols to be completed prior to 7:00 am on selected beaches to faciiltate this change. CHAPA urges you to attend one of the public scoping meetings and to be prepared to voice your opinion on these important topics. CHAPA will also prepare and present recommendations to the NPS and we will share them with you at a future date. The NPS press release announcing the dates and locations for the scoping meetings follows. Every individual that enjoys fishing at the Cape Hatteras National Seashore shold comment on the proposed changes to the current restrictive ORV regulations that are in effect in CHNS. We note Mr. Couch's statement that there is no process currently in effect to make written comments on the changes. As soon as that process is announced, we will post it here and on the DMS Facebook page. It seems odd to say it. Ray Bivins, Director of the DNREC's Division of Parks and Recration, announced that vehicles accessing the beach via the surf-fishing vehicle permit will now be restricted to park single-file along the oceanfront. This restriction is intended to facilitate enforcement of the surf-fishing vehicle regulations for being actively engaged as well as adressing safety concerns for beachgoer's and park staff. The "restrictions also stipulate that vehicle parking will be accommodated 'on a first-come, first-served basis...' "
In a press release dated May 12, Director Bivins noted that the number of surf-fishing vehicle permits to be issued in 2015 is expected to exceed 15,000. 11,380 permits were issued in 2011. DMS was one of a number of user groups that Parks and Recreation had approached in February, 2015, seeking input on a number of options the Division was considering to manage the number of vehicles on the beach during periods of heavy use, most notably at CHSP on weekends and holidays during the time between the start to the Memorial Day weekend to the Labor Day holiday. Options being considered at the time included, but was not limited to, a quota on the number of vehicles permitted to use the beach during periods of heavy use and a reservation system. DMS members were advised of the position of the Board of Directors regarding the options. We asked for input on the DMS position as well as input on the options presented by Parks & Recreation. Over 50 DMS members voiced their opinion. They overwhelmingly supported the enforcement of the "actively engaged" provision of the vehcile permit regulations. DMS members also overwhelming supported the hring of additional officers armed with arrest powers to enforce all Parks regulations. Increase the number of full time/sworn Enforcement Officers armed with arrest powers to enforce current and future park regulations. Enforce the current regulation for being actively engaged when accessing the beach with the Surf Fishing Vehicle permit. Utilize Seasonal Officers for parking duties when required during high-use times. Limit the number of vehicles accessing the beach with the Surf Fishing Vehicle permit at CHSP on Saturday, Sunday and holidays during the summer season. While doing so may limit the number of vehicles at CHSP, those Surf Fishing Vehicle permit holders unable to use CHSP can access other State park beaches. The vehicles accessing the beach parks park in single file along the oceanfront to facilitate the enforcement of park regulations. That access to the beach by vehicles using the surf fishing Vehicle permit be on a first-come first served basis. DMS also launched a petition urging Parks and Recreation to enforce the "actively engaged" provision and other regulations already in place, hire more personnel and to meet a problem that has been growing over the years. 1,831 persons electronically "signed" the petition before it was sent to Director Bivins. We thank the DMS members that voiced their opinion as well as the fishing community at large for support of our petition. Congratulations to the DMS Team of captian Keith Schmierer, Barry Brittingham, John Meade, Steve Merrick, Andy Twardus and Tim Wallace on thier fisrt place finish at the 2015 Ocracoke Invitational Surf Fishing Tournament held April 30 & May 1 on Ocracoke Island, NC. The team took control of the tournament by landing 20 fish and scoring 77 points in the second session on Thursday on a wet afternoon. Friday's strong 30 MPH winds strirred up the sea with grass becoming an issue. They still were able to score some points, cementing their hold on 1st place. DMS beat a strong field, including teams from NCBBA, Team Advanced Fishing, and 68 other teams from NJ to SC. Find photos and updates from the tournament at the DMS Facebook page. Find local news coverage and a photo slide show from the Island Free Press. More than 20 persons attnded the first Meet and Greet of 2015 held Saturday, May at Herring Poiont in Cape Henlopen State Park. Chairman Eric Burnley reports that 3 people expressed interst in joining DMS. The next Meet & Greet is schedule for June in the faithful Steward crossing area. Detail will be announced shortly. March 21 was clear but cold as over 250 volunteers engaged in DNREC's Annual Beach Grass Planting. This year, the volunteers planted grasses on the reverse side of the primary dune north of the Indian River Inlet, helping stabilze this important protective barrier. DMS supplied hot beverages and snacks to the volunteers. Over 80 persons enjoyed an evening of camaraderie at the Frankford Fire Company hall on March 14. The delicious meal of roast beef, veggies and dumplings was prepared by the Frankford Fire Company's Ladies Auxiliary. A large number of donations made the raffle a huge sucess, with 2 rod-and-reel combos, 2 Bud Graves oil-on-canvas paintings and an Ellen Rice giclee print offered as the major prizes. The latest in club apparel was also available. Please check the THANK YOU module on the front page for the list of both business and member donors. Keep them in mind when considering purchases of the goods and services they offer. Publlic comment period for the 2015 striped bass options for Delaware closed on March 10. The Hearing Officer presented the information to the Division of iIsh & WIldlife. F&W hasmade a recommendation and forwarded it to the DNREC Secretary. The Secretary will make the final decision. We are hoping to have a decision from the Secretary by April 15 so the regulations will go into effect in may (Piblished on May 1, in effect 10 days later on May 11). We will try to get a press release out as soon as the Secretary has made his decision. A hearfelt "get well soon" to long-time DMS member John Cristea as he faces medical problems. DNREC's Division of Parks and Recreation will implement increased user fees to access Delaware's state parks beginning February 15th. Increases in the Annual Pass fee and Surf-fishing Vehicle fee will take effect then. Daily user fee increases will take effect March 1. In December 2014, DNREC held a series of open house presentations - one in each County - where it revealed the proposed increases and asked for public comment. Across the board, the increases range from 23% to 50%, with an average increase of 29.64%. The increase for surf-fishing vehicle tags range from 23% to 27.27%, depending on residency and length of tag. Click here for a Cape Gazette news article on the fee increases. DMS extends it deepest sympathies to DMS member Gary Born after the tragic loss of his daughter, Nicole Born. Nicole, 40 was an avid angler and had won awards as early as age 13. Nicole died suddenly on January 4th due to complications arising from an influenza infection. She is the mother of 2 young children. She was laid to rest on Saturday, January 10. A news outlet offered this quote from Gary on his daughter: "She was just a dynamic.. a dymaic person. Full of energy, full of life. The smile that radiated from her face just light up the room." Memorial contributions in Nicole's name can be made to: The Animal Welfare Association, 509 Centennial Blvd, Voorhees, NJ. Find more on Nicole by clicking here. How the NPS protects threatened species. No surprise there. U.S. Rep. Walter B. Jones (NC) introduced H.R. 4094, the Preserving Access to the Cape Hatteras National Seashore Recreational Area Act, which would return management of the CHNSRA to the Interim Protected Species Management Strategy and Environmental Assessment, issued by the National Park Service on June 13, 2007. Representative Jones' bill needs congressional support and co-sponsors. You can help solicit support by writing your U.S. Representive, urging him/her to so-sponsor and support this bill. You do not have to be a resident of North Carolina to do this. As a House bill, it is open to debate by every member of the U.S. Congress. That means your representative, no matter where you live. Let the members of the US House know you support US Rep Walter B. Jones' H.R. 4904. When writing any member of Congress, being concise and on-point is the best way to go. You may also want to contact the members of the Natural Resources committee, as well as members of the Subcommitte on National Parks, Forests and Public Lands. Find your representative in the US House of Representatives here. Who is on the House Natural Resources Committee? Click here. H. R. 4904 was sent to the The Subcommittee on National Parks, Forests and Public Lands. Click here for who is on this Subcommittee. If you want a copy of H.R. 4094, click here. Will Chincoteague Island NWR Close the Beach to ORV? If it walks like a duck, quacks like a duck and looks like a duck, it must be a duck. Given what has happened at the Cape Hatteras National Seashore Recreation Area, the awarding of a federal grant to Chincoteague Island NWR brings that old proverb to mind. Read on, and see if you can find the duck. A recent DelMarVa Now article reporting that the Chincoteague Island NWR will receive a $1.5 million federal grant to purchase land to be used as a parking lot is raising supicions that it ultimately could keep vehicles from accessing the beach there. Additionally, the awarding of the grant has taken Chincoteague's Mayor and an Accomack County Supervisor by surprise. Mayor Jack Tarr: "We thought we were in the CCP process and getting to make comment ... This is kind of telling us that we don't." Regarding CINWR Director Lou Hinds, Supervisor Wanda Thorton was quoted that Hinds "should just tell the community the facts ... In my opinion he has misled the community." Virginia's U.S. Representative Scott Rigell, in a letter to the US Fish and Wildlife Service, called the action "a classic example of ... government imposing its will without regard for the will or economic well being of the people." In the same letter, Rep. Rigell asks questions that have a ringing echo of questions that were raised (and ignored) in Cape Hatteras. If you think you have read this sort of thing before, you are right! The same type of remarks were made by lawmakers, community leaders and stakeholders - that includes YOU, the ORV user - during the recent long, bitter, contentious "fact-finding" at the Cape Hatteras National Seashore Recreation Area. The outcome of that process, which was rife with false science, ignoring the comments of the communities/stakeholders, disregard for the historical use of the beaches and the economic impact to the area, has lead to severe restrictions on not only ORV access, but to all access in parts of the CHNSRA. Being cut out of a process, not being able to make comment, being misled? Lawmakers raising concerns about the economic impact of a questionable plan being imposed without community input? Could this grant to purchase land for a parking lot end in loss of ORV beach access at Chincoteague Island NWR? If it happened at Cape Hatteras, it can happen at Chincoteague. The noose of restrictions on beach access, be it for ORVs or pedestrians, is coming nearer to Delaware. It happened at Cape Cod. Next it was Cape Hatteras. Now it is Chincoteague Island. Access to Assateague Island is being "studied", which is government-speakfor "restrict ORV beach access". Where next? Don't forget your GFL or your FIN#! You can purchased your General Fishing Llicense at many bait and tackle shops or on-line from DNREC. Click here to go to DNREC's automated licensing system. Click here to get your free FIN number. Jeff Stickle, our Newsletter Editor, has reported the cost of producing and mailing the Club Newsletter have risen dramatically in the past year. Each newsletter that is mailed now costs the Club near $1.00 each. With recent rate hikes announced by the United States Postal Service, we anticipate the cost of each newsletter to exceed $1.00 by the end of 2012. You can help the Club save money by having it sent to you inbox. Read the newsletter at you leisure, at home or on vacation, and store it electronically on you computer's storage area without fear of it being inadvertantly thrown away. Recently, the Atlantic States Marine Fisheries Commission (ASMFC) voted to implement large scale reductions in the landings for menhaden, or bunker, as we anglers call it. Nothing posted yet on the AFMFC website but there is a good article in the Washington Post on this topic. In a nutshell, the current regulations allow for the harvest of 92% of all adult bunker in the Chesapeake Bay and Atlantic Ocean! The new regulation permits only 70% of the bunker to be harvested. The mehaden reduction giant Omega Protein Corporation of Reedville, VA, harvested 160,000 metric tons of bunker- about 450 million menhaden, or 80% of all menhaden. The remaining 20% was taken for use as bait.